Inexpensive Personalized Wall Clocks, Custom Printed in Bulk. Promotional, Round or Square. 10 in. to 12 in. Diameter. Plastic or Aluminum Frame. Budget Prices in USA and Canada. 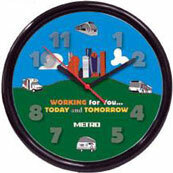 Economical promotional wall clocks quartz crystal movemant and with full color custom imprint. Free artwork design. We will send you a proof for your approval before production. 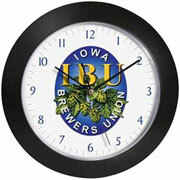 Budget Prices in the USA and Canada for wholesale personalized wall clocks. American clients pay notaxes. TC180T: 10" Round Aluminum Wall Clock with One Color Dial. Imprint Size: 3" x 1-3/4". Aluminum frame. 1 AA battery is included (not installed). 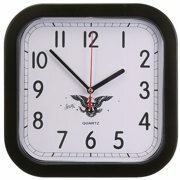 TC181T: 9-1/4" Rounded Square Wall Clock with One Color Dial. Black Plastic Frame; Imprint Size: 3-1/4"x3-1/4. 1 AA battery is included (not installed). TC182T: 10" Round Plastic Wall Clock with one Color Dial; Imprint Size: 8-1/4" Diameter; requires one AA battery (not installed). 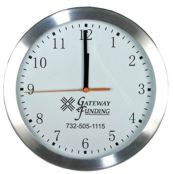 TC188T: 12" Diameter Plastic Round Wall Clock with One Color Dial. Standard Production is 5-10 working days afTer artwork approval; Rush Service is available: contact us. TC181T & TC180T: Full-color setup is $80 + run charge of 50¢ per clock.